Today feels like a remake of “Groundhog Day,” Bill Murray trapped as a commentator on CNBC over and over for the monthly release of the same employment stats. But there is more in this week’s news than meets the woodchuck’s eye. Jobs up (economy added 223,000 in June), incomes not (hourly wages flat in June, up 2 percent year over year). Unemployment down (more Americans escaping the workforce, possibly tunneling beside the woodchuck to the underground cash economy). Manufacturing is doing better (June ISM to 53.5 from 52.8). Manufacturing is also doing worse (factory orders down 1 percent in May, revised down 0.7 percent in April). Add to that established pattern: A long weekend ahead with an unknown Greek gift on Sunday, so today money has gone to bonds for safety, rates down a little from yesterday. Had we gotten a better employment report, rates would have spiked today, Greece or no Greece. Bonds are now in a state of coiled tension, anticipating Fed liftoff in September. Up to that point, all makes some sense, if only by repetition month after month. But the repetition conceals deep uncertainty and contradiction. At the Fed, speakers close to Chair Janet Yellen hint that they would have lifted from 0 percent by now if it weren’t for the odd weakness last winter. Their urgency is plain, partly for bubble-interception, but mainly for the oldest of all their reasons to take away the punch bowl: If workers become sufficiently scarce, sooner or later wages will rise. And the Fed gives only passing mention to conditions ex-U.S.
A few at the Fed see signals of rising incomes, despite the Bureau of Labor Statistics-zilch today. All still speak of “normalizing” the federal funds rate between 3.5 and 4 percent, which would mean mortgage rates 6 percent-plus — not survivable for many years; not without rising incomes. The Fed is prepared to begin normalizing — tightening, no matter how euphemized — while every other central bank on Earth is adding to emergency easing. The Fed has its logic, but reality intrudes. The U.S. economy was vulnerable to wage-price spirals from 1945 until about 1995, but in that interval was also largely free of labor competition from overseas (exceptions: the cheapest manufactures, and Japanese cars). In the last 20 years, overseas competition has crushed U.S. workers. China quintupled national credit outstanding in an emergency effort to escape the Great Recession. It escaped — but still has that debt and is now in an emergency effort to rebalance its economy from runaway spending on infrastructure to a modern consumer economy. Last winter, China began corporate privatization via opening its stock markets. Since October, the Shanghai Composite leapt from 2,000 to 5,000, margin debt quintupling (that word again); new credit limitation in a month collapsed it to 4,000; and Sunday, a fearful People’s Bank of China (PBoC) adopted its most extreme easing ever. The Shanghai is still sinking. More for ego and “reserve currency” pretense than common sense; China did not devalue versus the dollar last winter along with the rest of the world. But it cannot maintain People’s Bank of China emergency ease and a dollar peg simultaneously, not with the Fed in bolt-headed determination to tighten. Then, all media are soaked in Greece, but 99 percent of stories are off the point. Two points: how Europe got into this mess, and the consequences. Entry: When peripheral Europe joined Germany on the deutschemark-euro, the conversion exchange rate was too rich, which made the periphery (including France) feel rich and spend without behaving like Germans. Which was why they joined. The Germans, incredibly, expected the others to reform themselves while simultaneously refusing to reform its own trade and budget surpluses. Nearly all “analysis” tries to assign blame. Give it up. All are to blame and deserve each other. Consequences. Markets trade in fear of weekend surprises and instability. That is the European problem: Consequences are unknowable. If you’re game for sweating the unknowable, stick with the big one: central-banking Groundhog Day. Nobody knows the risks in a central bank-dependent world, whether continuing emergency ease, stopping or doubling down. 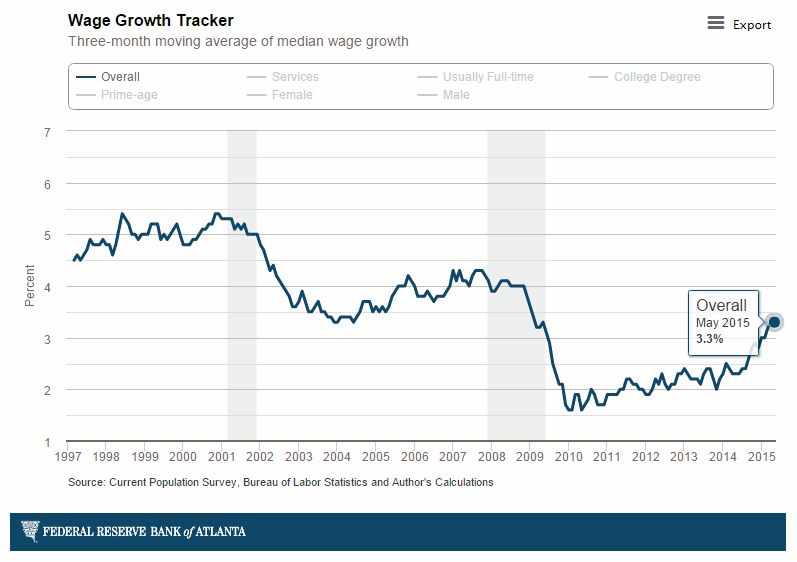 The Atlanta Fed has two new “trackers,” the newest guesstimating wage growth. In very fine print at bottom, “Source: … and Author’s Calculations.” That’s a confession of hunchwork. I am not convinced by arguments that wages are rising from pitiful trend. Yet. 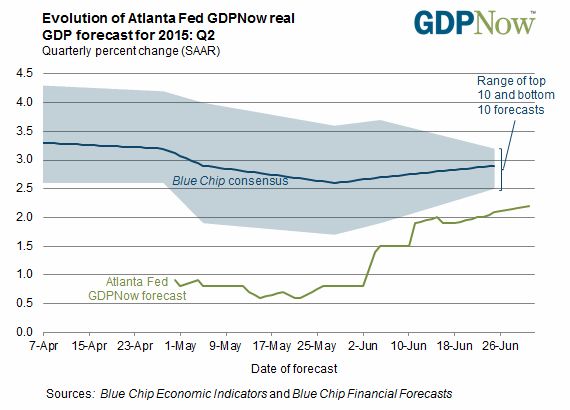 The Atlanta Fed’s GDP Tracker has already shown predictive power. However, creeping up to 2.5 percent growth in the second quarter does not in any way justify Fed blustering about “normalizing” in any nearby year. 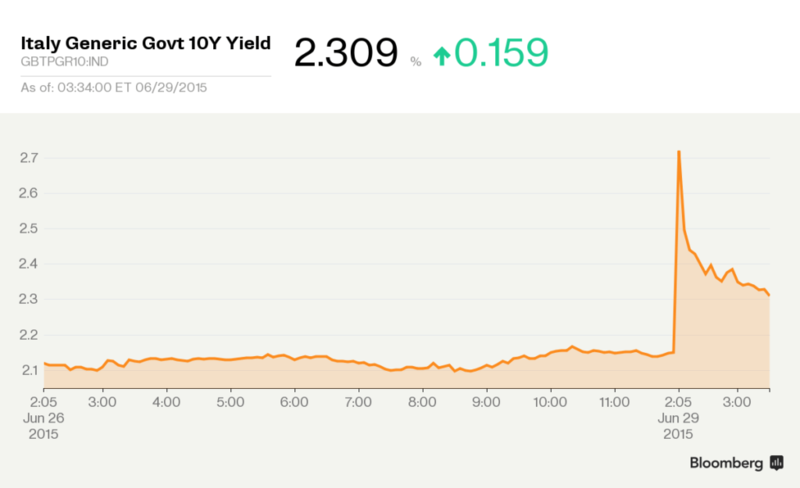 Monday chart of Italian bond yields. Spain looked the same. Greek contagion is real, there. 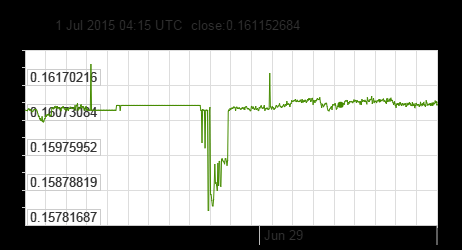 China’s yuan in the last week, its value expressed $/yuan. Note Monday’s reaction to PBoC easiest-ever announcement, expecting devaluation, unstable trading since. Nothing whatever to do with Greece, and far more important than Europe’s disgusting drama. 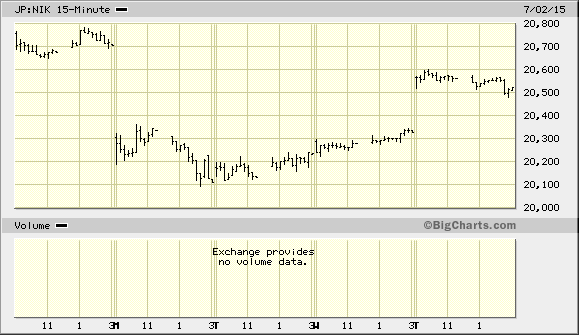 Japan Nikkei average, chart is one week. Lost 2.88 percent of value on Monday. Couldn’t care less about Greece — tracking Shanghai index and PBoC.